Why this seemingly shocked report (including the video) about John McCain? McCain to reporter: "Why would you ask anything so stupid?" While McCain's answering a question with a questions could be labeled a non-denial denial, it was actually a reasonable question to ask the reporter. To ask McCain such a question and expect an honest answer would mean the reporter expected better behavior from McCain. Such an expectation is indeed stupid. In February 2008, immediately after McCain locked up the GOP primary votes that earned him the nomination for president, I warned Beware The Wrath of 'Cain. The man's bitter resentment for constitutional Americans was well established long before that. He treats the Leftists Sinister as if they are his brothers and conservatives as if they are vermin. So even in 2008 it wasn't news to anyone who pays attention to how just about any Prog Republican treats any conservative. But especially John McCain. Meanwhile the SSM treats him most of the time (when he's not running for President) as if he's a fair and decent man. They always favor those who advance the Prog agenda. What rubs me the wrong way is how often he is treated with kid gloves by those who claim to be conservatives. Like perhaps your favorite talk show host. Or even a blog favorite such as Bill Whittle. Do a search on Bill Whittle and John McCain. I could not find a single instance where a negative word was said or written about McCain -- except in the comments to various Whittle videos, and not by Whittle himself. I swear folks. It's just like I said in the title of my last blog post You Lie to Yourself At Your Own Peril. When big name "conservatives" don't say the obvious, most little guys are afraid to ask tough questions lest they hear from the big name "conservatives" a John McCain type condescension "Why would you ask anything so stupid?" As my friend Fran Porretto suggested, when you can't say "They Say" it, you are afraid to say it yourself. You permit yourself to be intimidated into silence -- be it by bigger names or by group-think -- at your own peril. And if the Republican Party had any real meaning they should have stopped him after the last time or the time before that or the time before that. Telling anyone that they lie to themselves at their own peril ought to be obvious to anyone with two brain cells with which to comprehend what will happen when one steps in front of a speeding bus. So then, why do we do lie to ourselves so often? I think from observation that herd mentality is far worse than most any of us want to believe. Despite my constant non suppression of asserting that death cultists must exert great influence in powerful circles, even I have still succumb to the urge to suppress lesser observations that I expect to generate reactions I rather not face. And in the long run, I also suspect that the likely outcome to the lesser observations being left unnoted is that their threats will grow larger and, thus, the downsides then would likely be worse by far. So I know I've been guilty. Many people have attested they have read Orwell's 1984. But how good is the average memory of it or anything else? And even should the memory be good, how many are willing to connect what they remember to what they witness in real time? I ask about being willing to make connections because there are a number of risks involved in doing so. Chief among these is the fear of being dismissed for jumping to conclusions. As a result, there is a requirement to piece all the evidence together before announcing the conclusion so as to be prepared to answer all outright adversaries, cynics, skeptics or casual scoffers rapidly and as thoroughly as possible. However -- and this is the game changer -- it now matters not how well prepared we are for debate. Those who resent our abilities to answer them with facts, reason and rationality want us just to shut up, and they will charge us with all the things our well-backed-up arguments -- if permitted a fair hearing -- would belie. See the world for what it has become and adapt! We now live in an age where those who control the major outlets of communication, what most people refer to as MSM, but we here at Pascal Fervor refer to as the Soviet-Style Media, SSM, have hired people to spout utter nonsense without a shred of evidence, and are quite willing to slander any whom they wish with baseless charges. Charges of racist, sexist, homophobic, xenophobic, Islamophobic -- I'm sure I'm forgetting a lot more -- are brandished to the point of meaninglessness. But that does not mean tossing such charges are not still deemed as useful by those who pay for the service. They approve by renewing the contracts of all those who spew such unsupported "stupidity." I put stupidity in quotes because such evil assertions are more easily deflected by calling them stupid than to take umbrage -- which would require a stronger response. So it's often called stupid by someone not willing to risk the implications on them of drawing the connection of evil intent to those who seek to gain by tarnishing the reputation of their opponents. And besides, such emissions are still food for mindless idiots to repeat to others of their ilk. Idiots will repeat any stupidity that suits them. So this is written to remind my readers of one of the more unclear notions that Orwell wrote about. It's an attempt to make it easier to pass the understanding along to others how novelist George Orwell (journalist Eric Blair) predicted the sort of repeated gibberish of which we see all the time on SSM, most frequently on CNN and MSNBC, but on every TV news outlet, including Fox, and ever increasingly in the products of the entertainment arm of the SSM. Of course he's right on one level, as I laid out above. And the direct answer to Darin's question was provided by Ed Bonderenka with the brilliant double entendre: "utter nonsense." There's much more to comprehend, and that's why I am looking at it more thoroughly here. Contend that Orwell predicted what may be called orchestrated stupidity. He gave it the name Duckspeak. He wrote several paragraphs in 1984 explaining the goal of the practice, but did not provide explicit examples. I’m guessing he didn’t give us an example because he could see the value in its use but had not yet seen it put to use. We, unfortunately, have been forced to live with it and have not yet figured out a successful counter-ploy since we individualists and targets of the oppressors don’t command the intrusive and omnipresent stage as the SSM does. Such a widely staged practice, its contents prevented from being fairly contested on that stage and thus easily employed for inculcating weak and weakened minds, provides material for the jabbering parrots you may hear every hour of every day. Emitting words without involving the higher brain centers at all. Wait. There's yet more. How did it evolve? Duckspeak may have begun in this country with the relatively minor behavior of Eleanor Clift on the long running PBS show The McLaughlin Group. It bore the initial appearances of a slightly less formal debate: a panel discussion between various political commentators who worked for establishment outlets. But it was always rigged to Clift's advantage in that she was always granted a hecklers veto. Whenever an argument seemed to expose the failings of some Leftist Sinister policies, those in charge of her microphone permitted her high pitched whine to overwhelm whichever opponent was speaking. It didn't happen all the time, but it proved to be an acceptable and winning format. It went on for over 20 years and until the death of the host. Suggestive that the resultant disorder that harmed fair discussions could well have been one objective goal of its host is that although the other panelists changed around over the years, only McLaughlin, the host, and Clift were regulars. Clift's behavior was essential in advancing the ability of nonsense to gain any ground on that program and in setting the pattern of what could follow on to undermine ordered discussions in our society. Following that, CNN advanced the assault on reasoned debate with a show titled Cross-Fire. In that one, the shouting was more pronounced as the title of the show explicitly suggests. In other words, the appearance of decorum was far less often preserved. And given all that CNN has come to represent in its support of all that has become ever more openly sinister to what America once stood for, their advancement of Duckspeak appears to have taken the practice about as far as it can go. The facts of the situations we have witnessed in only the last few years indicate that the effectiveness of Duckspeak has dwindled quite a bit. The most flagrant practitioners may be needing to look for new jobs assuming they survive the extremists who have begun to eat their own. The failure of nonsense to win over new parrots to utter the nonsense is why authorities in universoties and skools who are committed to the failing Prog agenda have increasingly resorted to shut-down real debates where students might actually hear clear, reasonable, rational arguments that expose the huge numbers of failures being forced down our throats. And expose Duckspeak for the utter nonsense it is. That also explains why authorities all around the country, even more deeply committed to the failed Prog agenda, have allowed violent thugs to appear masked and with bludgeons and mostly tied the hands of law enforcement to prevent their unlawful acts. It explains why the crony-corporate funded SSM invoke invalid apologetics for Antifa's antics and grants those thugs the uncritical use of the label Antifa without once acknowledging incident after incident where Antifa's actions match exactly those of past fascists and other violent organizations such as the Democrat Party's violent auxiliaries in the KKK. This may be another reason why Orwell didn't explicitly provide examples of Duckspeak. It would have been too stupid to write about convincingly. This is because, once again, truth is stranger than fiction. Who could believe a fiction wherein someone would say that Doctor Seuss is racist and others would repeat it? Only in the real world! Face it. Even if it's in decline, as far as Orwell once again proving to be a predictor of the tactics to expect from those seeking absolute power and his understanding of how it would diminish of the ability of the intended subjects to resist, he was right. Let's get on to the lunacy. Essentially these liberal professors may have finally awakened, realizing the Left Sinister is not liberal but as bad as the fascists the Antifa claim to oppose. Can you imagine that? 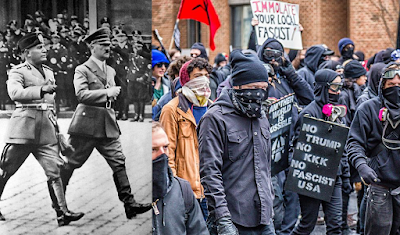 Antifa is not only not what they claim to be, but they are what they claim to be against. Are these profs yet so naïve that they still can ask 'how is that possible?' Seems so. Why next they may awaken to the fact that the overarching group from which the violent Antifa sprang, the Progressives, are really regressive authoritarians, the original masters of disguising themselves and hiding their agenda of gaining power by any means necessary. This find by a friend, and sent to me, is priceless. I'd never have read this site on my own. I wish I could say I enjoy the schadenfreude, but I fear too many patriots will have a share of their karma. All who have known better, but wrote off evil too often as mere stupidity, means all earned share. Now let me answer the link's final wondering question "Is the Antifa fight against fascism actually fighting for fascism without realizing it?" Yes. Definitely yes, you dolts. For sure, there are undoubtedly useful idiots within Antifa who don't know it. They provide cover for the violence the thugs have inflicted and will continue to inflict -- just as you libs with all your alleged good intentions provided reasons and cover for the Left Sinister to incrementally steal power for the last one hundred plus years. But the bastards who provide them funds, train their leaders, and see that hardly any are arrested let alone restrained, know full well these are fascists. And you "intellectuals," because you are only just wondering if they are fascists, are indeed dolts. For even if you are wise as serpents, and are still playing a role trying to convince us you've been fooled, you are still dolts. Because, in the grand scheme of things, you will pay a price, one whose painful extent you are too stupid to see. The consequences of resentments are rarely explored. Shakespeare did it once; Othello was a tragedy. I've been a flawed man all my life; and now I can add old and worn-out to my excuses for imperfection. Be there anyone who ought to thank God for the happiness He has graced me with, it is I. Consequently I fret that I fail to show adequate thanks and faith when I don't speak out, as at least one of my acquaintances demurs, because of those dear held hostage by the more powerful. Anyone who justifies their silence about wrongs they see as being "for the children" is drowning his conscience for short-term gains -- even where not delusional -- at the cost of tossing away liberty and justice to secure the long-term. If what follows is less than a thorough examination of the resentful and those driven by resentment, it is far better that I try to convince you poorly that this is a matter of grave importance than for me to throw up my hands in frustration and stay silent. Resentful people at all levels of society, but particularly at its highest levels, have gotten away with murder for far too long. What they murder is peace. Peacefulness allows for the pursuit of happiness by the widest number of people. Happiness, as I'm inferring, is the thing that the unhappy resent the most. It seems to me that perhaps the single most important thing never to covet is happiness. Perhaps the biggest reason for this is that there are as many causes for happiness as there are individuals. Unless one is completely deranged, one who aims to destroy of the happiness of another gains nothing. And the problem I'm highlighting is that there seems to be a lot of derangement being nurtured by the even more despicable. And this brings me to why I am writing this screed. Social Justice is a lie designed to reverse what are justly held possessions and steal portions under cover of smarmy words, claiming the intent to give them to those who have less. These perpetrators claim to be contemporary Robin Hoods, but they are doing to today's legal owners what scoundrel medieval English nobility had done so that Robin Hood had to steal it back to give it to the rightful owners. Today, as things become ever more unpleasant by interjecting politics into every aspect of life, the rogues and their ever increasing numbers of henchmen plus the usual large number of useful idiots begin to have an ever worse impact on everyone's happiness. They have made it their goal to not let anyone enjoy anything as long as someone somewhere may not be content. Lots of people see it as madness. That's become the common and cavalier way of refusing to acknowledge the evil content of most any threat. Rather than fight evil, they willingly judge the perpetrator(s) as simply mad much as our courts do when deciding not to indict for trial someone deemed insane. It's hard to discern when it is cowardice or laziness that accounts for this. It is certainly not a responsible response. Echoing what Jordan Peterson said in the video central to my post of last week, those who claim to be seeking social justice for all the best of reasons are effectively lying thieves. It only makes matters worse when they have permitted themselves to believe the lie. So many useful idiots, so few gallows. For an awful example of a believer in "social justice": those who expressed satisfaction that the targets of the Las Vegas mass killer two days ago were country-music concert goers -- and thus likely "Repugnics" -- are the type who only wish for unhappiness on others to equal their own. Equality seeking at its most low. Add to that that so few on the Left Sinister raised a voice in protest to such gross and truly repugnant public statements, and it drives home my point. The most virulent of the Social Justice Cretins (SJCs -- I refuse to call them warriors) are evil, exhibiting the most extreme meaning of the word sinister with which all the Left are rightfully tinged. The most reprehensible, of course, are the one who get the ball rolling with the propaganda networks. They stoke dissatisfaction, always for their own sinister purposes. A formerly happy person can be made unhappy when they have reason to fear destruction of their happiness. And that makes the Sinister happy. Iago did that to Othello. Out of resentment for being passed over he sought revenge by fabrications intended to make Othello jealous that his wife was having an affair with the lieutenant whose promotion initiated Iago's scheming for revenge. The well-healed in our society are quite well aware of the kind of resentment and the bad consequences portrayed in that particular play. Iago even turns to the audience to explicitly guide the less than bright on how to implement such a scheme. Thus they know how to do it, and full well see the kind of tragedy that can befall a society that is constantly encouraged to covetousness and the envy and jealousies that follow. In my opinion the risk is too great that they must intend for it to be. I have struggled to write this well enough that more will be convinced that the danger is too high that I am right. I hope it helps the rising generation punish as never before those who either seek to gain temporary happiness at the expense of others, or when unsuccessful, attempt to ruin the happiness of everyone else out of spiteful jealousy. But the most important thing for this generation -- or any other for that matter -- is to always be skeptical enough to be wary of people who peddle dissatisfaction. Thus gladly enjoy your happiness to spite their worst attempts to ruin it. Oh they may promise you Utopia if you but heed their siren calls. But remember this about Sir Thomas More when he wrote his novel. He knew it was a lie, and hence the translation of Utopia is "no place." My favorite proof that Utopia is allegedly the place where everyone is happy. But if that were so, where would the misanthropes and practical jokers be? Their little secret is that the practical jokers convince large numbers to go there, and only after there do they discover that the misanthropes are running the place. On the bright side, there seems to be a meme on resentment making the rounds. Since I published Vengeance of the Power Elites Pleases Satan, I stumbled across emissions at two other blogs, Declination and Liberty's Torch, who wrote about the resentful and resentments of the kind needing to be battled much more severely. I spotted a third too, but lost it. The first of these was inspired by a comment Dystopic received, so that makes 3 people in a short time span. What caused me to notice the first blog piece was that the commenter could have been quoting what Jordan Peterson said in the video published only a couple of weeks ago (Sept 12, 2017), but didn't credit him. All innocent enough because it could simply be that Professor Peterson himself had not started the ball rolling. He simply rang a bell that resonated well with a lot of thoughtful people, and many more heard it because of his renown had risen in great part due to him having been a publicized target of the SJWCs. So I consider it good that the dangerous emotion known as resentment is getting more attention today. But the attention given it so far doesn't appear to do to much more than provide one more reason to distrust those in power and those seeking it. And that's an old distrust, at least to the political Right of this contemporary world. What I'm advocating -- and this is different from the others who've dealt with the resentment meme -- is an offensive move in behalf of righteousness for the sake for happiness itself, and not solely to protecting material gains and property (true justice in law) as the SJC would have the world believe. Those who are unhappy for any reason should not be permitted to destroy, without comeuppance, whatever happiness us poor souls can enjoy. It's long past time for such an offensive to be mounted against them and the rulers and would-be rulers who gain by their demands. The value you place on life hangs in the balance.